Last week, John Manuel editor-in-chief at Baseball America, posted his latest Mock Draft, the 4th such edition that Baseball America has released. Meanwhile, MLB Pipeline‘s Jonathan Mayo released his second full mock draft as well. These are two of the foremost draft experts in the country and thus we wanted to take an opportunity to examine their thoughts. Not to be outdone, ESPN’s Keith Law released his Mock Draft 2.o as did Frankie Piliere of D1Baseball, but since they’re available to subscribers only, I did not recreate them below. As always, please visit the respective sites for source material and commentary. MLB Pipeline, ESPN, and D1 Baseball all had Florida’s A.J. 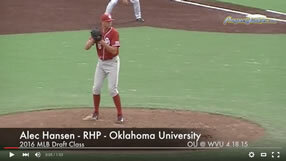 Puk going to Philadelphia #1 overall and that was before his strong performance against LSU in the SEC tournament in front of a healthy contingent of Phillies scouts. For the outing, Puk went 7.1 innings, 6 hits, 2 runs, 2 walks while striking out 7. Baseball America went with prep outfielder Mickey Moniak of La Costa Canyon (Calif.) as the top choice. Moniak is regarded as having one of the better hit tools in the draft, but I suspect that if he comes off the board first, it means Philadelphia has cut a pre-draft deal and will be gunning for additional upside and perhaps a difficult sign at pick 42. There doesn’t appear to be much industry consensus at the #2 pick. ESPN and Baseball America believe that the Reds will take Puk if he falls and I don’t blame them. Puk is the top player I’ve put eyes on this season in a list that includes Mercer’s Kyle Lewis and Louisville’s Corey Ray. Both Lewis and Ray are candidates for the Reds at #2, as is Tennessee’s Nick Senzel. If Lewis goes to the Reds at #2, Ray seems to be the popular choice at #3, though that’s also the first time you start seeing New Jersey prep lefty Jason Groome’s name. Groome, along with Riley Pint, a Kansas high school product with a thunderbolt for a right arm, have perhaps the most upside in this draft but there has been a spotty track record at best among recent elite prep arms in the draft. That’s another article for another day. Baseball America has Stanford’s Cal Quantrill going 8th overall to San Diego. Having missed all of the 2016 season as he recovers from Tommy John surgery, Quantrill is one of the bigger wildcards in this draft. Baseball America has Louisville closer Zack Burdi going 12th overall while MLB Pipeline doesn’t have him listed in the first round. Burdi is a flame throwing righty who works in the upper 90s with his fastball who may have the chance to start as a professional. In a draft weak on catchers, Baseball America has Louisville’s Will Smith sneaking into the first round. I’ve seen Smith several times over the past few years and while he’s always had decent defensive tools, he’s started to put it together offensively late this season, improving his stock with a few home runs in the ACC tournament last weekend. Prospect Junkies has been able do write ups and get video on many of the prospects noted on each list below. Those we’ve seen, we linked back to our scouting reports. Jason Groome, LHP, Barnegat (N.J.) H.S. Braxton Garrett, LHP, Foley HS, Ala.
Ian Anderson, RHP, Shenendehowa HS N.Y.
Jesus Luzardo, LHP, Stoneman Douglas Fla.